Ever since I can remember, I’ve been a very active person, constantly involved in all type of activities, switching from jogging to basketball to swimming to rollerblading to hiking to Pilates and others. As traveling, reading and getting informed always opens your mind, I wanted a change in lifestyle, to pollute less, exercise more and stay healthy. Having said all this, I’ve decided a few month ago, to start cycling, like most people do in any civilized country from the West. But this isn’t easy in a country where the national sport is sitting on a bench in the park and listening to loud music on the phone speakers while eating sunflower seeds and making fun of the people who exercise. Extreme Survival – How to Guide? You want to become a cyclist in Romania? Then you have to be ready to fight the drivers who turn you into a moving target, nasty looks and stupid questions like: ‘Why don’t you just get a driver’s licence and drive a car like a normal person does?‘ ( news: I already have one!). To make it even more interesting, there is no such things as bike paths in Bucharest. Besides this, riding the bike on the side of the road puts you in danger, as passengers open the car doors without any warning, drivers turn left or right without looking into their side mirrors, and pack of strays try to bite your legs off. In a country where everyone drives only thinking about themselves ( and sometimes not even this much) cyclists have a very hard time! It’s not a day in Bucharest in which I don’t witness an accident and see many more about to happen, being avoided in the last minute. After getting the bicycle, I’ve spend half a day on the internet trying to figure out where can I cycle safe in the capital city, like you do in any other European city, on a bike path. Hours later, the answer: you can’t! You either cycle in the park ( for a beginner is ready hard when needing to avoid unpredictable dogs and kids) or on smaller roads of very poor quality ( cracks and street bikes just don’t go together) or the only bike path in Bucharest, a very small one, which looks like this. The choice you have to make in Bucharest: shall I risk hitting a dog/child in the park OR get my wheel stuck in a crack in the perfect Romanian concrete from side streets or smaller roads OR hit a pole/car on the famous bike path above? As every change always starts with yourself, ignoring all of the above, it was time to find the right bicycle, MY bicycle, and I’m sure the right choice has been made. And I couldn’t be more proud. I feel like a kid, who finally got the desired toy, when I ride my new baby. Now I can’t say I’m an expert when it comes to bicycles, but she’s definitely a work of art! It was complicated to learn how to ride it properly ( the bicycle is wicked fast so it took me a few hours to master it), and the bad road quality, mixed with the constant stress of being hit by a car or hitting a pedestrian or a puppy, made it even harder. But, practice makes perfect! It’s been less than a month now, and after 100 km of riding it, I’m happy to say the only problem I had was with a fence which jumped in front of my bike when I passed by it ( this is exactly how it happened and I stick to my story! 🙂 ). Even so, I try to ride on small side roads, parks and forests, later in the evening, when the chances of getting into conflicts with the traffic or pedestrians are significantly smaller. Other option I’ve found, was to travel by car to a remote location, and cycle on the secondary roads in the area. Ideal? Not in the least, but is better than no cycling at all. My biggest wish for Romania: a change in mentality. You are not ‘cool’ if you make fun of joggers/cyclists and you won’t become any ‘cooler’ if you drive a car and show no respect for the other people in traffic. I wait for the moment when people will start driving conscious about other traffic participants and see the benefits of cycling: less traffic jams, health improvement, cleaner environment. 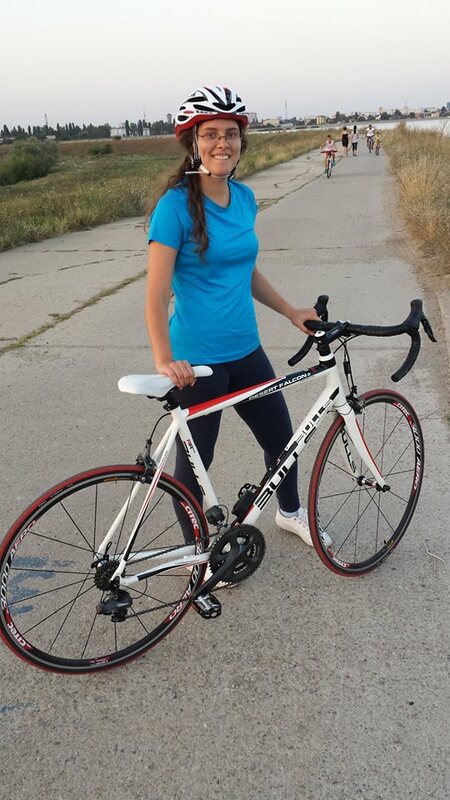 This entry was posted in Cycling, Travel and tagged bicycle, Bucharest, cycling, path, riding, Victoriei by Lucy. Bookmark the permalink. Sounds like a lot of exercise just trying to not get hit LOL. LOL yes, it’s just like that! great blog lucy ! after hearing about how bike unfriendly it is in Romania I am hoping you keep your helmet on when you ride.. I can see how sheep like people are were you live..we have our share here in the U.S. too. its from the poorly funded government education system and the mindless consumerism that’s rammed down there throat on the tv every day. sadly lucy you are at the mercy of those careless people when you take your life into your own hands as a cyclist in Bucharest. you can get a petition signed to build a bike path but you will need other cyclist’s to help you in your fight to have a bike path built. good luck my friend and be safe.. Enjoy riding…be safe and always keep watching for everyone and everything (fences, etc.) else that comes your way…. Thanks for reading Frances! Those fences jump out of nowhere 🙂 I’ll be safe!